I have purchased a second hand pool and I'm not sure of the brand as the lady couldn't recall the name and no longer had any instructions for it. When I got the pool it was being stored in a barn and therefore I haven't seen it together besides a few photos the lady showed me. I do know it is suppose to be a 15' X 32' oval pool with 14 buttresses (7 on each side) and they attached to a hold down plate that is a 90 degree "L" shape piece of metal that bolts directly to the front part of the buttress. My main question is how do I join the bottom curved track that the pool wall sits into, to the hold down plate or buttress? And it would be so helpful to find an instruction manual online with more diagrams and instructions. It would even be helpful if you had any thoughts of what brand I may be looking at. Also, I should note that I am from Canada but am not sure from where the pool originally was made. Any help you could offer would be so appreciated. Hi Eve. There are links to sites with instructions on this page. 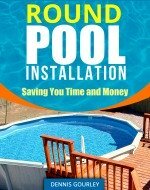 These pages show oval pools being installed. They might help also. All oval pools have some sort of bracket that attaches to the end buttresses where the track attaches. Some are just a piece of metal that sits in place but most are brackets that are bolted, or screwed, to the upright. On second thought, not all oval pools have such a bracket. This is one pool that does not. The end rail simply rests on the buttress channel and hooks into the steel upright. 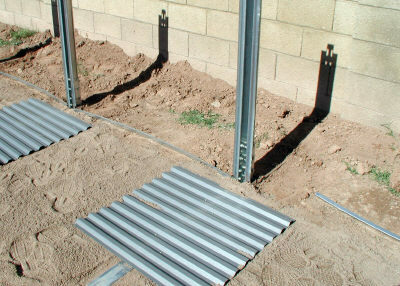 Decorative covers install over the steel at a later time. There have been times, when installing a used pool, that I have been missing a bracket or two. I would simply set the rail up against the buttress and hammer a piece of rebar on the outside to hold it in place. Once the pool is up and full the rail has no place to go, it just stays there. Having a bracket to hold it in place just helps during the installation process.